It is just for sale for a few months. The Woo Sports is a small waterproof device which measures and records automatically the height and air time of your jumps. You may see it as something similar as some people (men?) do with their cars; show off how good looking their bling-bling car is on a sunny boulevard with plenty people to watch. One huge difference though between a good looking car and a Woo; A good looking car needs money, a supreme height on the Woo leader board demands some athletic skills. The Woo should be mounted to you board, turned on and when finished kiting you read the results from your iPhone with the Woo App. Then the big comparing game is on; in the Woo app you will find leaderboards (World/Europe/Asia etc) including one for you and your followers/friends. Ranked either in height or air time. Main question of this review; how accurate is the Woo? Or even more important how consistent are the readings? If you think about it, you probably start to wonder how does the Woo actually measure the height and air time? Time to dive a little deeper in the Woo Sports. The Woo has a very difficult task; measure, calculate, register, send (Bluetooth) in harsh, wet, bouncy, cold and warm conditions. The Woo has a -waterproof – 9-axis motion sensor. The support page of Woo Sports tells us little more; The device uses accelerometer and WOO Sports technology to measure the height. The WOO analyzes acceleration and rotations on the board to detect jumps and calculate their characteristics. So no GPS satellite’s involved (Woo declares it would consume too much battery) but the Woo relies it’s measures on motion measurements. Interesting. It is food for thought…For example where does a jump actually starts and ends according to the Woo? What about the 3 meter wave you can use as a kicker to get you airborne? Is that added to the jump or not? The Woo shows the results of the measurements from one meter heights and above. Jumps from five meter are highlighted. It may suggest you may only take those from five meter and above seriously, probably due to its lower detection limit (LDL) in its measurements. Out of the current 220 users about 40 of them didn’t reach the 5 meter mark yet. So the majority of us out there won’t have a real issue with this LDL. The Accuracy of the height and air time is probably it’s major Achilles heel. Any data specialist will tell you upfront that focusing on maximum values (which the Woo does) is asking for trouble. Outliers are a common thing in measuring techniques. Therefore most measurements focus on mean numbers. For example if we talk of a certain wind gust it is usually measured in 2-minuted averages. Wikipedia explains 2 kinds of outliers; From those average readings you might get an outlier may be due to variability in the measurement or it may indicate experimental error; the latter are sometimes excluded from the data. We compared two Woo’s in one session on one board. Checking if the accuracy is correct (is a reading of 10 meter really 10 meter?) is much more difficult and probably less interesting. So we did not hunt the accuracy question, but we had as main goal to test it’s consistency in it’s readings. In other words: does your Woo record the same height and airtime as mine? Is the competition a level playing field?! We where out in a very rough sea with onshore 25 knots in a cold 10°C. The circumstances left us with results up to 9m of height. The first results immediately made this test very interesting; the maximum height jump was with 7.8m for one and 9m for the other one 1.2m (15%) off! 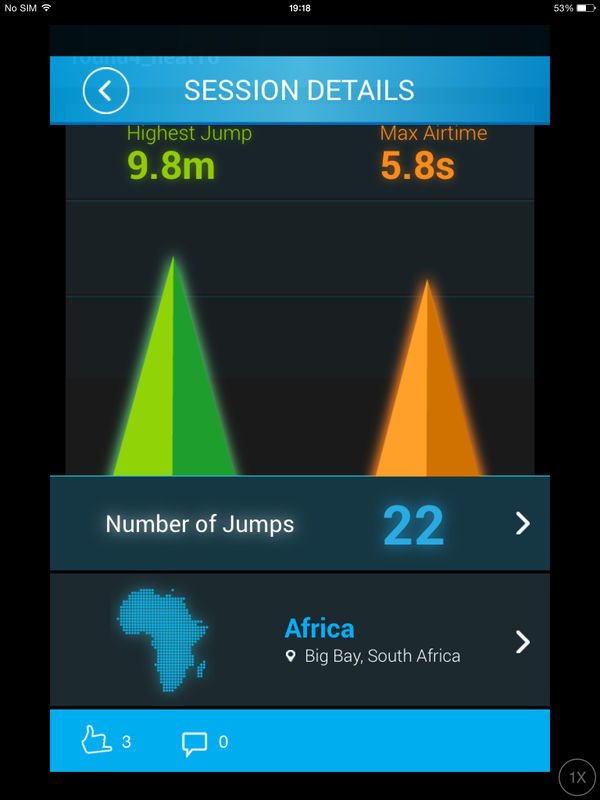 And there are more differences; The airtime is even more off; 1.5 seconds out of the 5.7 (around 25%). This time the Woo with the lower maximum height has the higher airtime. Surprisingly it wasn’t even the same jump on both Woo’s that was marked for Max airtime! A statistical overview is shown in the 2 graphs beneath. The Woo results are x-y plotted on height and air time. The graphs show 2 interesting results; Woo 1 is 15% lower in its height recording than Woo 2. The (cor)relation doesn’t improve introducing an offset. The relations of the air time recording between Woo 2 and 1 is a bit more complicated; The (cor)relation does improve with an formula. Which means it has both an offset and a correction; Woo 1 = 0,84*Woo 2 +0,87s. – The data below 4 meter was to different to compare. Sometimes we had jumps registered while on the other one there was nothing stored. – There was no evidence of any (maximum) outliers . All data points above 4m could be used. – During the test that lasted about 45 minutes, one Woo to the other had a time difference which had grown about 6 seconds. This is a lot more than we would have guessed. 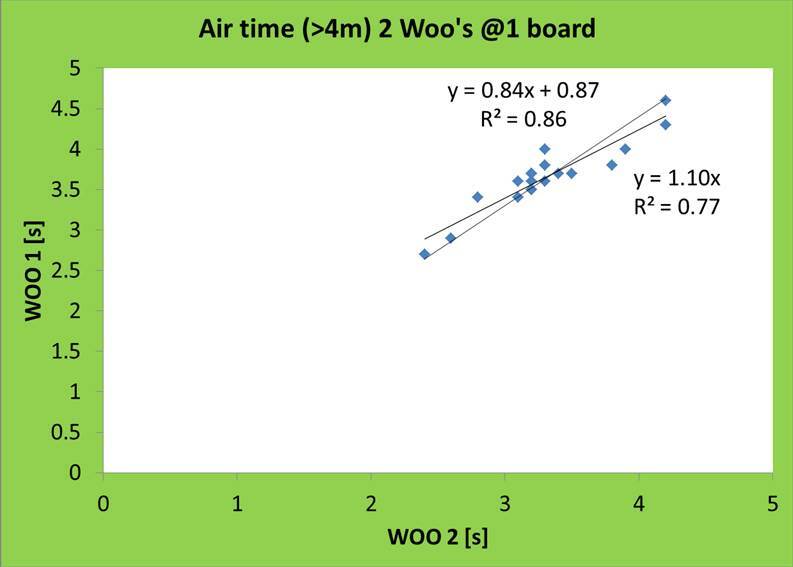 – The Woo’s different readings for which jump had the maximum air time can be explained from the graph (in green) on air time. 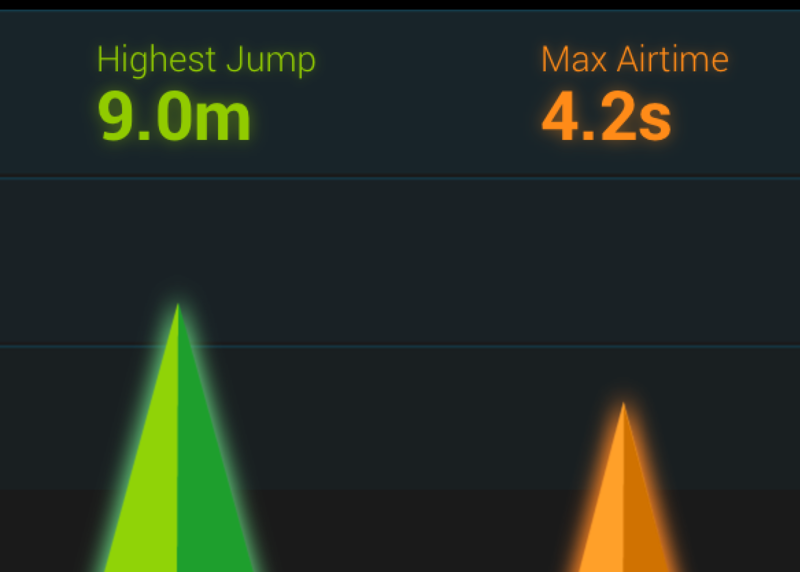 The 2 most upper points in the graphic show that 2 jumps were actually very close as being the longest air time. – The battery of Woo 1 was about 30% when we started this test. Woo 2 was 100% charged. We assumed the battery percentage did not effect the reading, but we did see some struggling (missed registrations of jumps) when Woo 1 was getting closer to an empty battery. – The distance between the two Woo’s on the board was about 40 cm. This could have been reduced to a few cm, which we will do in a part 2 of this test. – The regression should have been done in a more sophisticated way; by Total least squares or orthogonal regression. The method in Excel (linear regression as shown in the graphs) is however within 2 % of the statistical correct way (0,854 for linear to 0,844 for orthogonal regression). Most of the critical aspects above should not affect the results. However we promise, when the conditions are available (wind! ), to do a second test with more data, higher jumps, more Woo’s closer to each other on one board. Although we need a second test with more data, higher jumps and with more than just 2 Woo’s, we can say we are amazed what this little device achieves. However we get the feeling the product is 99% finished and not 100%. The most critical part is the comparability between the Woo’s. If tested and re-calibrated before being sold the Woo is really an amazing must-have for all kiters that want so save some proof of the most epic jump they ever made. And than off course compare with who ever you want. As far as we know there a little or no alternatives. A similar device as the Woo is the XensrAir. The Xensr is recording similar statistics on jump height as the Woo. Xensr was involved in the 2014 King of the Air in Cape Town as the Woo was in 2015. The Xensr has a similar price as the Woo and has a nice example on Youtube how the brothers Jesse and Shawn Richman compete to get the highest jump recorded. 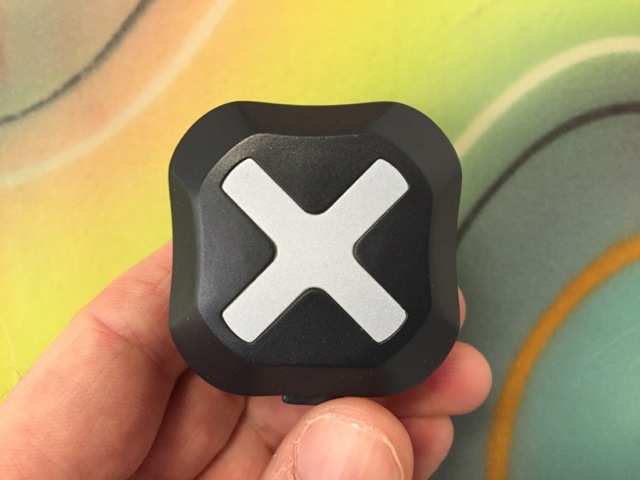 The Xensr works with a combination of a motion sensor and a GPS. There is an independent review of the xensr, but it doesn’t focus on the accuracy. We haven’t been able to check it, but is seems that the Xensr is difficult to get hold of in Europe. The XensAir is a new version of the existing Xensr which isn’t available yet. please give us some more information (or better some data). 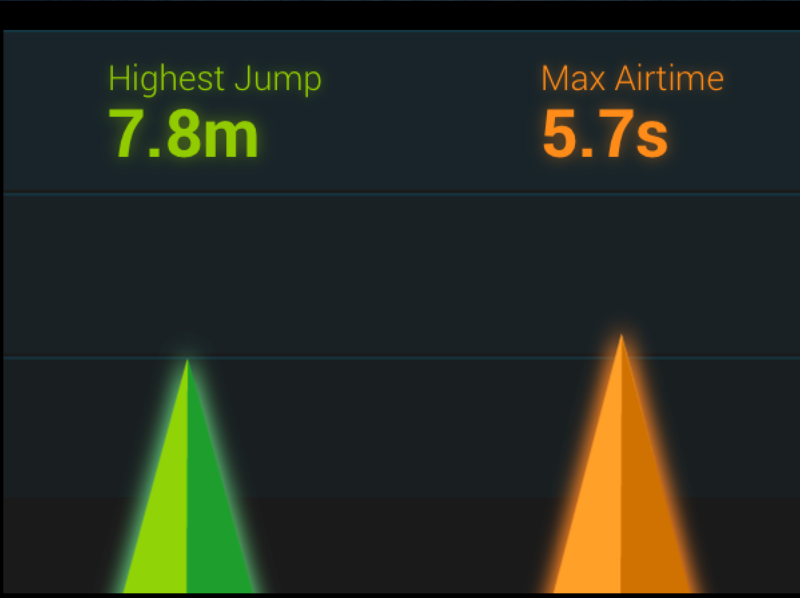 Is the highest jump different,or all? and around what hight are we talking? My woo is consistently lower when iv compared it with my friends by mounting both on my board. Is there anything I can do about that? I recently bought a Xensrair to try on my snowboard. It is a really cool product and I am really pleased with the software they have created. I am keen to hear how this performs on a kitesurf too as yet to try it. The XensrAIR has helped with the review of my tricks following a solid day on the slopes and is very simple and easy to follow. Would highly recommend it but keen to hear other peoples opinion on the product? I found the product in the UK at http://www.kitradar.com. The website also showcases some other great start up products if your interested in techy or functional products like me. Indeed Xsenair confirms the reaction of “Ice Surfer”. So at the moment it looks like Damien has something to explain. PS I emailed Damien to be sure he can react. PS 2 We are pretty sure he couldn’t have tested the device, since it isn’t out there yet, so no test no judgement. Therefor we deleted his reaction. Damien – hard to call it garbage when its not shipped yet, and I asked my friends at Xensr and they checked and nobody with your name ordered a unit. Take your BS elsewhere. Great review and looking forward to part 2! Thanks for you compmliment. As for the Trace up; we tried to get in touch with them and ask for a device (or 2) to test. No reaction so far. Nice review! I think the best alternatieve for the Woo is the TraceUp.